Vitrification was used between 1900-1914 and consists in rolling the hot glass on the marver in particles of metal oxide or powder made of coloured ground glass and re-firing to achieve a smooth and highly polished surface in all different colours. The effect is further enhanced by polishing at the wheel. Patterns can be acid-etched or wheelcarved into the textured surface. In this case there is no acid-etching , because the vase did not need to have any to expres itself. The picture is already there. A forest with trees and blooming bushes at the bottom. Note the extremely rare signature in vitrification. Note the extremely rare shape of the vase. On page 83 Daum by Noel Daum you'll find a similar example of this shape. 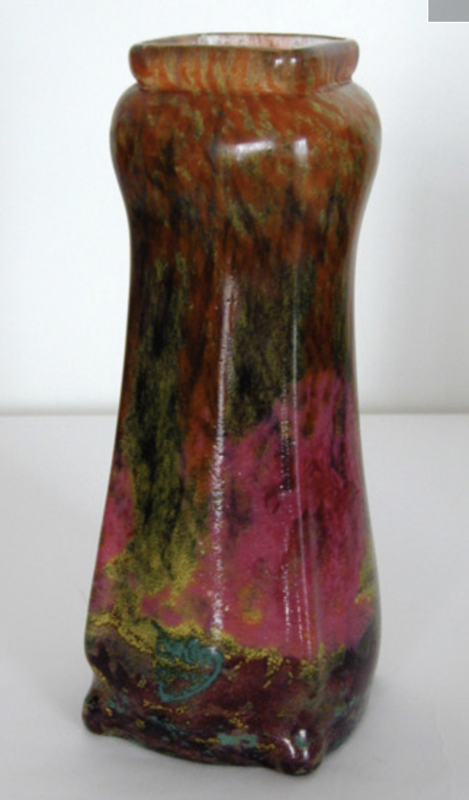 This vase was vitrified aswell. In the book of the collection of Gerda Koepff by Ricke and Schmitt page 204 you find another example.